Annandale, Virginia has the proud traditions of an established Korean immigrant community – the Asian supermarket, specialty shops, and most importantly, Korean BBQ. A relative new arrival to Annandale, family-run Kogiya has established itself quickly among its multi-ethnic clientele as a high-quality and hip purveyor of barbecued meat and other Korean dishes. Groups both young and old, international, Korean-American to Caucasian pack Kogiya even on weeknights. The hipster crowd streams in bleary-eyed for weekend late-night dining after an evening of ???? (possibly questionable) activities. An unassuming brick-front building from the outside, inside it has an industrial, modern Asian feel with long, dark communal tables outfitted with two grills each. Wall-mounted televisions intersperse the dining room, broadcasting several sporting events – not that one would be bored enough to take the time to watch them! If quiet, private dining is your fancy, this atmosphere is not for you. Korean BBQ is meant to be a shared, familial experience. Though it is much more low-key than the theatrics of Japanese hibachi or the frenzy of Mongolian BBQ, Korean BBQ and Kiyogi bring people together. So should it be your first experience with this style of cooking, check your comfort zone and germophobia at the door and share the experience with your family or friends. My introduction to Kogiya started off a bit bumpily. With an MSG sensitivity, I’m always wary of hidden MSG. When we asked our server which items had MSG, he initially noted that every item with a marinade would. Disappointed but surprised, it took a chat with one of the youthful owners to explain that Kogiya does not add MSG, but its marinades prominently feature soy sauce, which contains naturally-occurring MSG. That facet gives soy sauce its wonderfully addictive unami flavor, but thankfully for me, I’ve never had a problem with soy sauce. Sidebar: It was my introduction to soy sauce at the age of 10 that changed my food universe forever. That (expletive) is good! (It would have been earlier in life if my hypersensitive tastebuds had allowed me to be a bit more open-minded!). At any rate, Kogiya uses good quality meats and seasonings – and no added MSG. Kogiya offers several soups, appetizers, and traditional Korean noodle dishes, but the main attractions are its barbecued meat entrees, grilled tableside. Choose from one of several mixed grill selections. The unlimited menu features its signature pork belly, chicken, spicy Bulgogi, and others. A la carte entrees are also available, but then what’s the point of BBQ if you can’t try multiple selections? We ordered the all-beef menu: fatty brisket, Bulgogi (a marinated Korean specialty), and spicy Bulgogi sizzle atop a cast-iron pan. The pans are then replaced with grill grates, over which sesame-soy short ribs and un-marinated ribeye steak is grilled, then snipped into bite-sized chunks by servers with kitchen shears. The meats are served with three dipping sauces – a garlic-sesame oil blend, a pungent and sweet orange-soy, and tangy peanut-lemongrass(?). The spicy Bulgogi was my favorite of the five, with its sweet and tangy marinade. 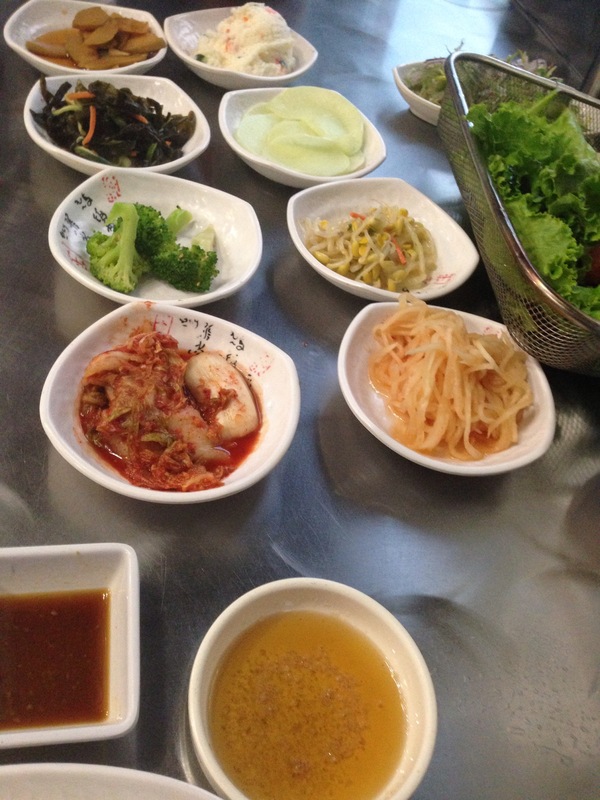 Of course, every entree comes with a vast assortment of pickled vegetables, including bean sprouts, broccoli, seaweed, cabbage, and, of course, kimchee, which takes a strong palate or acquired taste to appreciate. (Sorry, not a fan). Two soups arrive later – a flavorful, tomato-based vegetable stew and a light, soufflé-esque egg soup. 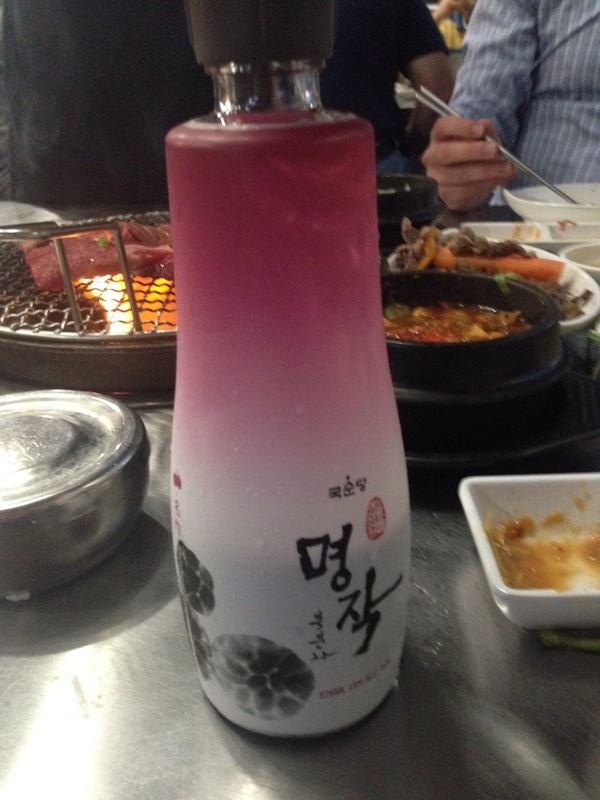 Alongside our meal, we tried a light Korean beer and a heavy, sweet Korean raspberry wine. The wine was only slightly medicinal in flavor, but it is served with shot-sized glasses not unlike those served with sake. The restaurant also serves several sakes, wines, and soju, a Korean corn liquor/wine available in several different flavors. Kogiya – or any good neighborhood Korean BBQ joint – offers a fun, communal dining experience with a multitude of flavors. Break from quiet, stoic restaurant meals with this lively, modern take on Korean traditions.